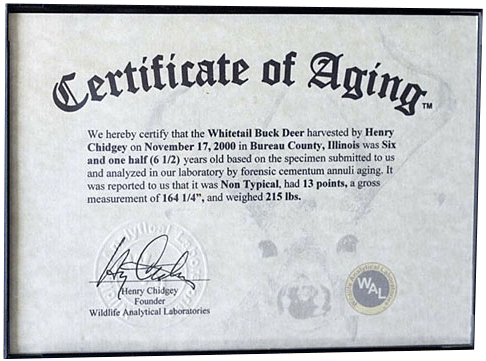 Wildlife Analytical Laboratories™ (www.DeerAge.com) was founded in mid 2004 by Henry and Mary Chidgey with a simple and focused vision. Their vision was to provide accurate and timely forensic cementum annuli aging of whitetail deer and other game mammals with a high degree of customer service. They believed that there are many people, who are passionate about hunting and managing habitat to realize the maximum potential of their deer herd. In 2014 Wildlife Analytical Laboratories partnered with a larger lab, Nationwide Histology to handle the increasing volume. With a full team of highly qualified histologists on staff producing top quality slides at a much faster rate allowed the quick turn around we so proudly offer. At the end of 2017 Henry & Mary Chidgey decided to retire and sold Wildlife Analytical Laboratories to Heather Marlatt, the owner of Nationwide Histology. Heather is not only a passionate scientist but also enjoys the outdoors and spending time in her fiancé Chad’s taxidermy studio. Chad is an avid hunter and travels globally to enjoy the sport. Wildlife Analytical Laboratories™ is now located in beautiful Missoula, MT where Chad and Heather live and enjoy outdoor recreation. My name is Heather Marlatt and I have spent my entire career dedicated to scientific pursuit. I attended Washington State University and graduated in 2009 with a bachelors degree in microbiology. After school I began working for the state veterinary diagnostic laboratory, where I learned to be a skilled histologist; I also acquired my international histology certification. In 2011 I quit my job to open Nationwide Histology with the goal of providing the highest quality service for research clients across the nation. After partnering with Wildlife Analytical Laboratories it quickly became my favorite line of business. It was all I could talk about. When Henry & Mary approached me with the idea taking over it was an easy decision. I love this company! I love what we do! I has been a joy from minute one. I look forward to continuing to provide the same quality of service for years to come. My name is Henry Chidgey, a proud American and son of the State of Texas. I have spent much of my life in the pursuit of knowledge and techniques to manage habitat for wildlife, especially the whitetail deer. Our company, Wildlife Analytical Laboratories™ was created out of the belief that with accurate, precise, timely feedback of age to hunters and others interested in managing whitetails for maximum trophy potential—whether buck or doe—the fulfillment of many hunters’ dreams today and in the future will be realized. My wife and life partner Mary and I thank you for giving us the opportunity to serve you andyour commitments as wildlife stewards over the last 15 years. It is time now for us to pass the torch to the next generation who we believe will do an even better job at serving you. Heather Marlatt and her team will be taking over the business at the start of 2018. Heather has become, inaddition to a valued part of our service delivery over the last 4 ½ years, a dear friend and trusted colleague. We are confident you will come to trust and value her as we have. Of course, Mary & I will continue to support Heather in any way she desires. Burnet will be immediately forwarded to DeerAge.com in Missoula.